Last weekend Battle on the Bank VIII, the National banked track championships, was hosted by the Tilted Thunder Rail Birds in Seattle, WA. Eight adult teams competed for a chance at becoming National champs: Arizona Derby Dames Hot Shots, Los Angeles Derby Dolls Ri-ettes, Orange County Roller Girls Psycho Ex-Girlfriends, Penn Jersey Roller Derby She-Devils, San Diego Derby Dolls Wildfires, South Side Roller Derby South Side Girls, Tilted Thunder Rail Birds All Stars and TXRD Lonestar Rollergirls All-Scar Army. 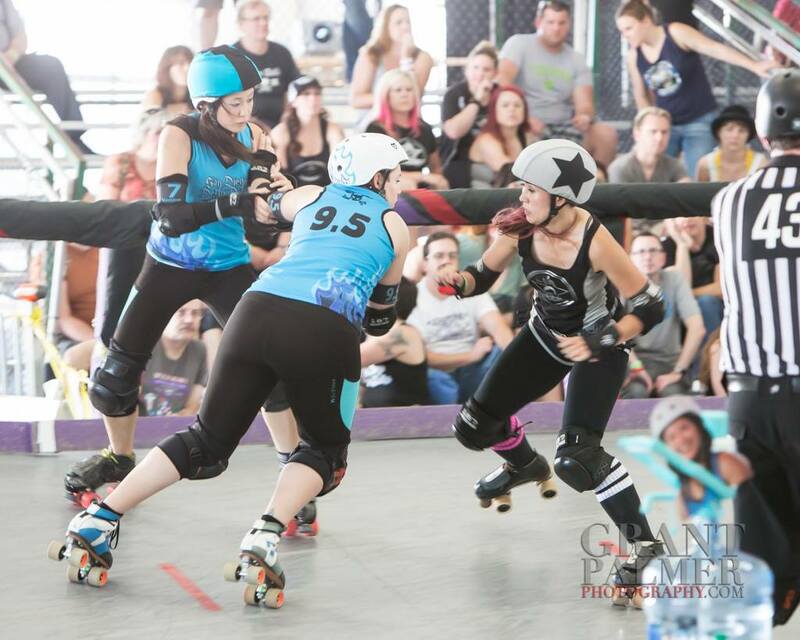 Three junior teams also competed: Arizona Derby Dames Minor Assaults, San Diego Derby Dolls Juvenile Dollinquents and Tilted Thunder Peeps. The Wildfires entered the championships ranked fifth, based on their performance during the 2014 tournament. San Diego played #4 Orange County first and beat them handily 95-34. Next up was Los Angeles, ranked first. In a hard-fought game, San Diego lost 107-30 and had to fight their way up through the rest of the bracket. San Diego beat #7 South Side 198-25 and then #2 Arizona 79-64 in their closest bout of the tournament. During the third place bout, San Diego beat #3 Tilted Thunder 196-66 to move on to the championship bout against Los Angeles. San Diego rallied and put forth their best effort of the tournament against #1 Los Angeles. Fans weren’t disappointed and said that, although the score didn’t show it, San Diego held their own against Los Angeles. 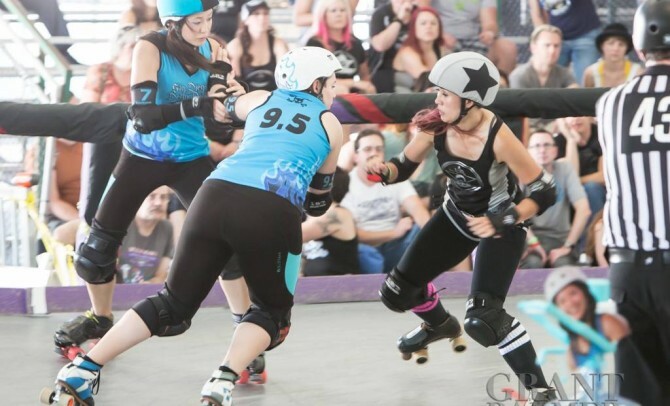 Walls were strong, jammers scored and the Wildfires burned it up. The final score was 261-67 with Los Angeles taking the championship. And, with that, San Diego became the proud owners of a brand new second place trophy. Well done, Wildfires. Well done. The Juvenile Dollinquents also took home second place in the tournament. Their first game, against the Peeps, was a real nail biter. It could have gone either way, but the score ended up 104-103 in favor of the Peeps. Their second game was another close one against the Minor Assaults, but the Dollinquents pulled ahead and won 111-93. Then the Dollinquents played the Peeps again on Sunday in the junior championship bout. The bout was close as each team played their hearts out, with a final score of 189-157. The Peeps took first and Juvenile Dollinquents took second. Not a bad weekend at all for San Diego. Be the First to Know! Find out about upcoming events and special discounts sent only to our newsletter subscribers. Derby United is committed to the creation of an empowering, athletic environment while enriching the lives of our members and community through the sport of roller derby. Connect with the San Diego Derby United and get rolling today. Copyright © 2019 by Derby United. Trademark pending. All rights reserved. Background photo by JCM Photo. Slider Photos: Tristan King.